From hot and sunny Africa, we want to wish you all a very Merry Christmas! Shannon and I had a nice time celebrating with the other missionaries on the station last night. We had a big meal all together – of curry! (Yeah, not your ordinary Christmas meal, but one of the missionaries is well known for his curry.) We were able to read the Christmas story together and sing some Christmas songs, as well as do a little gift exchange. Shannon and I also spent some time in the morning doing our own little gift exchange, and making cinnamon buns (yum!). This morning we went to the church for a Christmas day service, and this afternoon we’ll be heading back to the church for a big meal with all the people in the congregation. That should be interesting! 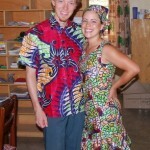 I’ve attached a little picture of Shannon and I in our African Christmas outfits that we had made here J We wore those to a wedding here, which was an interesting experience! The ceremony part was very long and very hot in a cramped little church, with loads of people sitting outside the back door or peering in through the window. Some of the musical performances they did there were really neat, though! After the ceremony, most of us (probably about 200+ people?) went to the home of the grooms parents for the reception, where they had set up a big covered area with benches for people to sit for the meal. Shannon and I were taken aback when they invited us to sit at the head table! I work with the groom, and Shannon and I had both met and talked with him a few times outside work, but we certainly had done anything worthy of sitting at the head table! But, I guess that is part of the cultural expectation – that visitors who have come all the way from North America are honored guests. We hope you all enjoy this special time of year, celebrating Emmanual, God with us. May God be especially near each one of you! Here are some pictures, mostly random for you all to see.